Published: 24th July 2017. Triumph UK. Considering his obsession with motorcycles since the age of four, Ben Walker has arguably landed the perfect job. His daily routine combines the roles of collector, counsellor and detective as he unearths some of the world’s most rare or forgotten bikes for world-famous auctioneer Bonhams. His inspiration came as a toddler when he was encouraged by his motorcycle-mad dad to press his nose up against the window of a vintage motorcycle shop called Verralls, near his dad’s office in Mitcham, south London: “I always looked but never had the guts to go in. Those bikes stayed with me and inspired my love of art, reading and wanting to do this job,” Ben says. Have you got a goldmine in your shed? His role as international department director of collectors’ motorcycles means travelling the world to examine the motorcycles belonging to anyone from celebrities to stunned couples who find a goldmine heirloom in their garden shed. “Sometimes, the bike has been in the family for a long time, so you have to have a lot of empathy with the sellers who have a strong emotional attachment. They maybe can’t swing their leg over it anymore and have to make the difficult decision to sell. It’s tough because riding a motorcycle keeps you young, so passing it on is a watershed moment. Once it has left their garage though, people tend to see the benefit of passing it on to an enthusiast or collector,” he says. The Bonhams warehouse, at a secret location on the outskirts of London, has been home to rare wine collections, furniture, Banksy paintings and even the cloak Alec Guinness wore as Obi-Wan Kenobi in Star Wars. Around 86% of bikes offered by Bonhams sell, a testimony to Ben’s valuation skills. Ben’s highlight in almost two decades of hunting hidden gems was the trail that led him and his team to a stash of eight Brough Superior bikes left to rust in a barn in Bodmin, Devon. 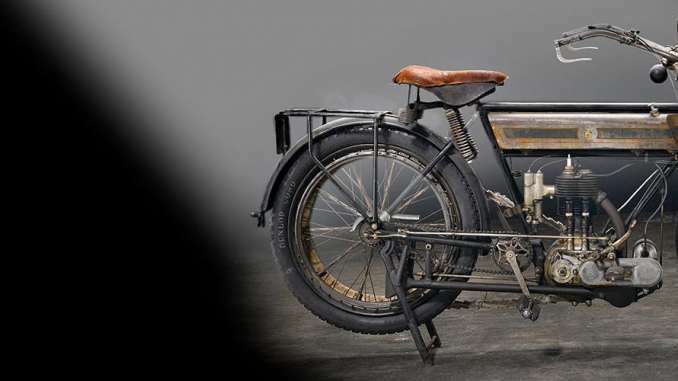 The haul, the last known collection of unrestored Broughs, had been abandoned when the owners went to live elsewhere and included a 1938 Brough 750cc BS4, which sold for £331,000 as part of the total £750,000. Ben is surrounded by a major moto celebrity’s bikes and trophies due for auction in Stafford later this year. Behind a black curtain, where we’re warned not to go, sits another haul of goodies in this Aladdin’s cave. A quick check when Ben’s not looking reveals a line of supersport bikes owned by who knows who. There’s initially something sad about such vibrant machines ending their days here, but Ben insists the warehouse is merely a stepping stone to a new life: ”We like to think that we help perpetuate the legend for a future generation of enthusiasts. When we get a Triumph in, there’s always a buzz of excitement because it’s a brand built on heritage. “This number plate was removed from the 1946 Senior Manx Grand Prix-winning works Triumph ridden by Ernie Lyons. He signed it ‘presented to Mrs Quayle from Ernie and the boys’ as a thank you to her when she was his landlady during the race.